It is said that "we humans share more than half our genomes with flatworms; about 60 per cent with fruit flies and chickens; 80 per cent with cows; and 99 per cent with chimps." This demonstrates something very important. Namely, how little our genes signify. Some folks take those percentages to show that humans are not all that different from cows or chimps. Others observe empirically that humans differ tremendously from these others -- you are not reading this on the bovine intertubes -- and wonder whether the genes are a meaningful metric of anything other than physiology. The great scientific revolutions, Chastek once observed, turned on seeing the significance in things that were negligible within their context. The difference between a circular orbit and the actual elliptical orbits that the planets follow is negligible. The difference between the Newtonian and Einsteinian dispensations matter only at high speeds. Yet the sliver of difference matters a great deal, even in so quotidian a thing as GPS. So the delta between man and monkey may well be very small genetically speaking -- but no one says we must speak only of genes. "I am unaware of even a single example of biological complexity which defies explanation within the modern Darwinian framework. Perhaps you could offer up such an example...?" This sounds very much like a claim that the Darwinian "framework" (i.e., "metaphysic") is not falsifiable, since one may always cook up a Just-So Story within it. Whether this is an "explanation" depends on empirical evidence that the story ever actually happened. We may spin a tale of How the Elephant Got Its Trunk, but it raises the question of whether the elephant actually did get its trunk that way. At least when physicists and chemists spin stories, they provide specific physical mechanisms with them. The "abominable mystery" of rapid angiosperm evolution. The result was a great spasm of dudgeon as defenders of orthodoxy rallied to... well, defend orthodoxy. Your list indicates to me that you are suffering from some significant misconceptions and/or a lack of understanding of what the Theory of Evolution by Random Mutation and Natural Selection actually is. Just addressing your first case, for example... well, antibiotic resistance is a textbook example of evolution in practice, and one that Darwin himself likely would have predicted (and certainly not been surprised by). Faithful Reader will have noted the Bait and Switch. Shapiro declared that the named items "did not occur by the gradual accumulation of random mutations" whereas Goren averred that they were "textbook example[s] of evolution in practice." This would be as if Maxwell had said that "the twocharged bodies did not attract each other by gravitational forces" only for Goren to reply that it was "a textbook example of motion in practice." Well, yes. "Evolution," like "motion," is a generic term. It means simply that something has "rolled out" from something else. It is the precise mechanism by which the rolling out occurred that is being questioned. Darwin's theory! I believe I shall faint. Bruce: Quickly Mabel! The smelling salts! Note also that it is de rigeur to imply that heretics are morally or intellectually deficient. It is not enough to say, "I think you are mistaken." You must cry out, "You are ignorant." Why this should be so for ignorance of evolution and not for, say, ignorance of algebraic topology or the theory of dielectrics is unknown. Most people actually are ignorant about most things. TOF for example does not know how to play a trumpet. But few are the matters over which such ignorance is an occasion for pearl-clutching and an attack of the vapors. "The idea of Darwin predicting conjugative plasmids, transposons and integrons was indeed novel to me. All Ben seemed able to envision is random mutation to antibiotic resistance. He was unaware that such mutations are irrelevant to the real world evolution and global spread of multiple antibiotic resistance determinants." Shapiro noted "how little some followers of TheWhyEvolutionIsTrue blog care about the molecular analysis of evolution." The insights of a 19th century natural philosopher are sufficient unto the task. Bacterial antibiotic resistance, Shapiro said, "evolves by horizontal transfer of plasmids and the accumulation of multiple resistance determinants by transposition and site-specific recombination," not by the gradual accumulation of random mutations. As a statistical practitioner, TOF has always wondered about that random mutation thingie. If it really-truly is random, there hasn't been enough time in the universe to gin up all the evolution that has happened, let alone the abominable mystery of the pace of it. If we are going to wait for a mutation that just happens to be "beneficial," Godot will have arrived and gotten bored. Jim, I just read your first blog entry. And, I'm sorry, but I don't see any significant difference between you and Behe on this. This is the mandatory equation of dissent with heresy. Fall in line, buster, or we will lump you in with the Untouchables and you won't be allowed to sit at the Kool Kids table in the lunchroom. But Ben's inability to see a difference may lie with his own myopia rather than Shapiro's proximity to Behe. The trumpet player associates the molecular biologist with the ID advocate because both the latter have noted that "we still lack a complete scientific explanation for well-documented evolutionary relationships between bacterial flagella, DNA transfer apparatus, and protein injection complexes used in pathogenesis." But surely it is possible to notice a fact and draw diametrically-opposite conclusions from it. Behe thinks this lack points toward intelligent design. Ben Goren fears it does. His fear that theokinesis is the only possible alternative drives him into the bunker underneath Fortress Darwin. But Shapiro thinks the lack points toward other natural processes, specifically genetic processes that we are only now beginning to understand. After all, in what other field of science do we still rely on the insights of mid-Victorian country squires? Again, all you're doing is pointing at something you don't understand and lack the imagination to guess at a reasonable understanding, and throwing up your hands and insisting that everybody else should quit as well and join you in your ignorance. Oh, dear. Shapiro has merely noted that there are other natural processes that also result in evolutions of natural forms. As if Maxwell were to claim that not all motions of ponderable matter are explained by Newton's theory of universal gravitation. Oh, wait. He did. But the physicists responded by saying, "Kool! ", not by accusing Maxwell of being a Newton-denier. When friend Goren wrote that bacterial acquired immunity was "a textbook example of evolution in practice" he committed a textbook example of confusing theory with fact. Shapiro had presented bacterial acquired immunity as an example of where Darwinian mechanisms could not account for an evolution, not as an example where an evolution did not take place. This confusion of "evolution" with "natural selection" is quite common. * But the former is a fact and the latter is a theory meant to explain the fact. This deserves a revisit. (*) Not to Darwin, btw, who avoided both terms where he could. The originators of a theory are often more tentative and nuanced than their textbook-taught epigones. Wade: [Dawkins] seems to have little appreciation for the cognitive structure of science. Philosophers of science, who are the arbiters of such issues, say science consists largely of facts, laws and theories. The facts are the facts, the laws summarize the regularities in the facts, and the theories explain the laws. Evolution can fall into only of of these categories, and it's a theory. Socrates once said that the unexamined life is not worth living; but Myers seems to brag about the limited mental horizons he ascribes to scientists. IOW, Myers is a technician not a thinker. How do we know? Because if he had thought about it he would never have used that locomotive-of-science metaphor. If the locomotive is science, we should remember that locomotives run down tracks laid by someone else and can only go to those places to which the tracks already run. Bad, metaphor, bad! Go to your room. But who are these philosophers Myers sees huffing and puffing alongside the engine telling its puissant Baconian engineer that facts and theories are distinct? Mere nithings, like Poincare, Mach, Einstein, and the like, who are not fit to drive P.Z. Myers' choo-choo. Patient Reader will understand if TOF pays more attention to the likes of Poincare. Facts and Laws and Theories, Oh My! However, in partial defense of Myers, he is probably accustomed to the Usual Suspects equating "theory" with "wild-assed guesses." But the knee-jerk reaction to this silliness is to assert that a well-substantiated Theory can somehow graduate to a Fact. Thus does one insanity beget it's Evil Twin. Falling Bodies and Evolutions are Facts. Gravitation and Natural Selection are Theories. Blyth first proposed natural selection as the mechanism that maintained fixity of species. It winnowed out changes that made a species less fit for the niche it already occupied. Darwin took his idea and imagined that if a (somehow) "beneficial" change should (somehow) pop up, the same selection process would (somehow) propagate the beneficial change, thus producing an evolution. Darwin did not say that Blyth almost got it right, or that Blyth did not see the full ramifications of natural selection. He did not mention Blyth at all; not even in the Sixth Edition, where he even found nice things to say about Lamarck. The facts did not back Darwin up. Specifically, the theory of natural selection predicted slow gradual evolution, stuffed to the gills with transitional forms. Instead, the fossil records showed species appearing suddenly from Schenectady and then remaining Blyth-ly fixed until they shuffled off to Buffalo. Darwin's response: the Facts were wrong. As more fossils are discovered, he claimed, they would fill in the gaps with transitions. Not the occasional missing link, mind you. Under his mechanism, transitional species should be two-a-penny. The theory did not explain how beneficial changes could become fixed into a species. Inheritance was thought to proceed by a "blending" of the traits of the mother and the father. (Hence, the language of "blood" and "bloodlines.") If so, a fortuitous beneficial change would be diluted out of the "bloodline" and lost within a few generations -- unless (even more improbably, unless you were Lamarck) the change appeared in large numbers of individuals in the same generation. Unbeknownst to Darwin, an Augustinian monk named Greg Mendel, trained in the hard science of physics, had already conducted a designed experiment in biology and discovered mathematical laws that showed that inheritance is digital, not analog. Some "unit of inheritance" akin to atoms or electrons carried the new trait and could lurk in the population until appearing in a later generation. The hybrid of green and yellow pea plants were either green or yellow, never chartreuse. There was no "blending." The "dilution" objection does not even arise. That took care of the second objection; but the first has stood. As more and more fossils were discovered, gaps stubbornly refused to be filled in. Sometimes "living fossils" were discovered, like the coelacanths*, once thought to be extinct for 70 million years, now honored as an "endangered species. "** It has perdured 400 million years with very little change. (*) Note: the linked article misuses the phrase "begs the question." Aargh! (**) "endangered species" is a term of art meaning "Gosh, we don't see a lot of these suckers around." 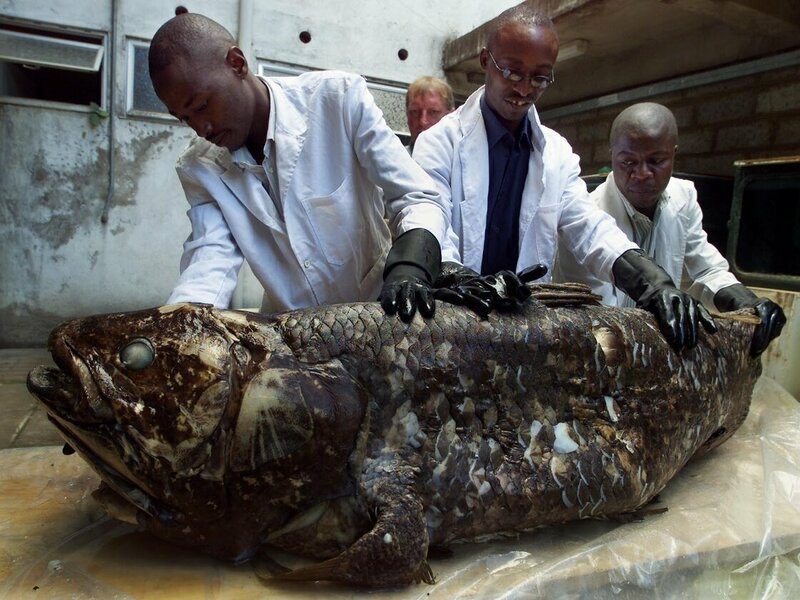 There seem to be two populations of coelacanths, one in Indonesia, the other off the African coast. The two populations separated either 30 million years ago (if you believe in geology) or 5 million years ago (if you believe in genetic "fingerprints"). In either case, long after the species was supposedly extinct. For an endangered species, the old fin-walker seems remarkably durable. There was not "no change" in the coelacanth. Genetic drift happens, which seems to be how we wound up with two modern species of coelacanths. But genetic drift is not natural selection. If the ecological niche to which the coelacanth was ad-apted does not change, is there any reason to suppose that the ol' fin-walker would change? It's like an L5 position in a gravitational system. 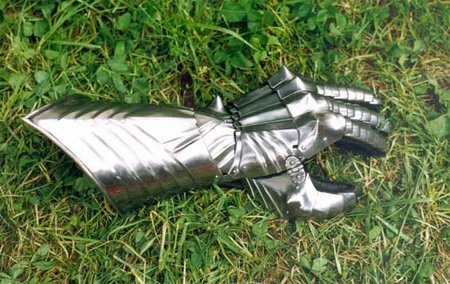 You need an applied force to move off it. Darwin was well aware of both objections, but he did not realize that the underlying similarity of the two lie in the presumption of analog rather than digital evolution. What if evolution is like heredity -- or most of physics, for that matter -- proceeding in quantum leaps rather than by slow, incremental changes? At that point, the granularity of the fossil record ceases to be a problem, or indeed, even an objection to evolution. The course of evolution, like that of true love, is never smooth. The fossil record remains stubbornly catastrophic (in the mathematical sense of Thom's topological "catastrophe" theory.) As Niles Eldrige once remarked, it is unreasonable to suppose that transitional forms always occur off-stage. Catastrophe theory [see, e.g., the cusp catastrophe, nearby] shows how motion on the manifold of equilibrium points can result in sudden change in state space even if the changes in parameter space are gradual. Certainly, it seems reasonable to suppose that the facts (fossils) are right and the theory (gradualism) is wrong. After all, gradualism was an a priori assumption used to devise the theory and thus cannot be a conclusion derived from the theory. In order to combat the pseudo-teleological arguments of William Paley for a divine watchmaker, the evolutionists rigorously excluded all notions of goal-oriented activity from their theories. In keeping with 19th Century mathematical thermodynamics, they insisted upon randomness at the microscopic level as the basis for macroscopic effects. As evolutionary thinking came to terms with Mendelian genetics in the neo-Darwinian Modern Synthesis, it adopted the mechanistic thinking that prevailed following the intense Mechanism-Vitalism debate of the early 20th Century. Notice that all three are metaphysical choices. They are not conclusions derived from study of the subject matter. The irony is that these choices were being made at about the same time that physicists were beginning to abandon them. "the social sciences, like much of biology but unlike most fields of the physical sciences, have to deal with structures of essential complexity, i.e. with structures whose characteristic properties can be exhibited only by models made up of relatively large numbers of variables." 3. The Mechanists prevailed over Vitalists because the latter "could not explain the nature of their hypothetical special life force." This culminated in N. W. Pirie’s The Meaninglessness of the Terms Life and Living (1937) [and more recently in Scientific American, "Why Life Does Not Really Exist"] and Charles DeKoninck's sardonic response "The Lifeless World of Biology" in The Hollow Universe (1964) in which he claimed against the mechanists that there really is a difference between living and dead. Shapiro notes that "the rest of the 20th Century and the beginning of the 21st Century provided a finely ironic turn to the philosophical debate." Which, if either, is the True Evolutionary Tree? 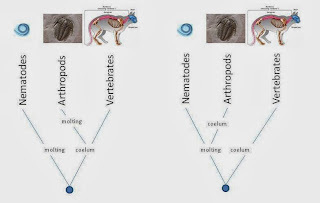 Consider three great animal phyla: Nematodes (roundworms), Arthropods (bugs), and Vertebrates (beasts). Beasts have a coelum (body cavity). Bugs both moult and have a coelum. It is not logically possible for both moulting and the coelum to have evolved only once. One must be a case of convergent evolution. One school of thought holds that the coelum evolved once in the ancestor of the bugs and beasts, while the roundworms off to the side invented moulting. Then the bugs split off from the beasts and re-invented molting independently. 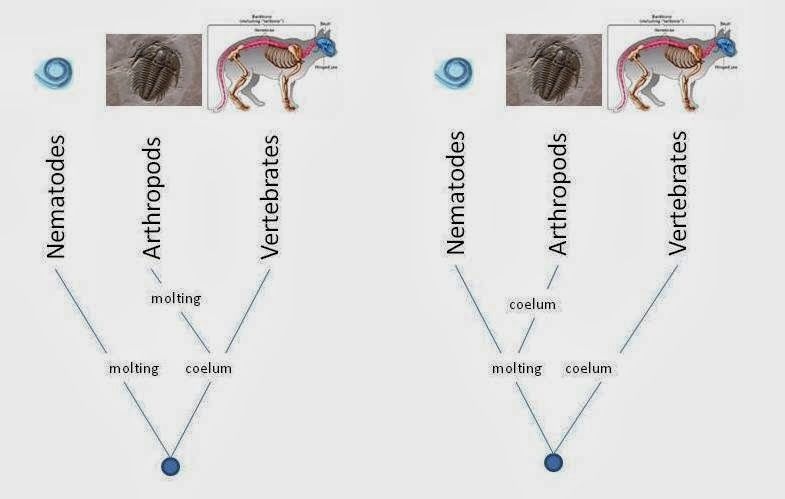 A second school of thought holds that moulting evolved once, in a common ancestor of bugs and roundworms while off to the side, the beasts developed a coelum. Then later the bugs independently developed a coelum. There is deep disagreement on which two phyla share the common ancestor, let alone how long ago it lived. Reconstructed trees fare no better when "genetic distance" is used instead of gross features. More than one "tree of descent" is always possible. Confusing the issue is convergent evolution. For example, there have been three kinds of "rodents." A reptile, not a rodent; but who cares? 1. Tritylodonts. During the late Triassic, a family of mammal-like reptiles developed into specifically rodent-like reptiles. They varied from mouse-size to rabbit-size, had enlarged incisors followed by a gap and then a battery of multi-cusped cheek teeth very much like modern rodents. They lasted 50 million years, into the mid-Jurassic. Don't mess with Mr. Multi. 2. Multituberculates possessed similar dentition to the Tritylodonts, but were full-monte mammals. They took over from the Tritylodonts in the mid-Jurassic and thrived until late Eocene times. They were the most successful group of mammals ever, and the only mammal group ever to become completely extinct. Telicomys compared to cabybara and human. 3. True Rodents. Began to thrive as the Multituberculates began to fade. 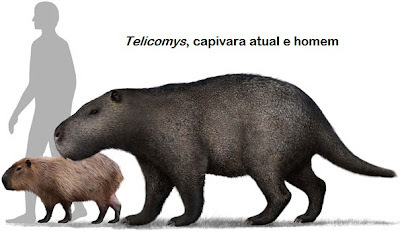 Some prehistoric rodents, like Telicomys, were the size of rhinos. Liebe Zeit! The Knife of Knatural Selection whittles the same round pegs for the same round holes. There must be something in evolution that "points toward" similar solutions to the same environmental problems. Sometimes, this is uncanny. Placental mammals gave us sabre-tooth cats; marsupials gave us saber-tooth thylacodonts. Transmissible hereditary changes are the material cause of evolution. That is, they provide the "matter" on which evolution works. Lamarck, Darwin, et al. had no clue why some changes were heritable and others were not. With the rediscovery of Mendel's work in the early 1900s, the "gene" was invented. (Literally: it was an abstraction invoked as a unit of heredity. No one knew if it had physical existence or, like epicycles, was merely a useful notion that allowed things to "work out.") People began to imagine that "mutations" in critters reflected differences in the "genes." Now, instead of being excoriated as lazy and shiftless, people were said to have "bad genes." In a way, this was worse. You can, with effort change become not-lazy. In the 1950s the form, or structure, of DNA was discovered and we could examine how change (κινέσις) or "mutation" arises at the molecular level. The simplistic notion of "a gene for green" changing into "a gene for yellow" became more nuanced as the complexity of genetic structures became more and more evident. As genes turned out to be extremely complex the deeper we dug into them, the whole random/thermodynamic model assumption began to grow untenable. There are mechanisms within the gene that act in decidedly non-random ways. It's not really like gas molecules at all. 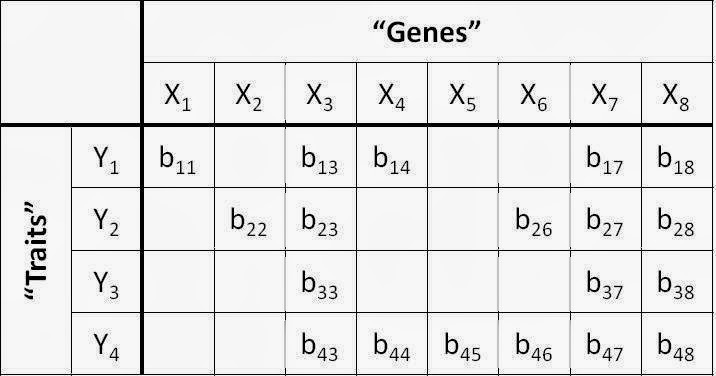 In this analogy, gene X1 contributes to trait Y1 only. But trait Y1 is also influenced by genes X3, X4, X7, and X8. Gene X3, in turn, affects traits Y2, Y3, and Y4. And so on. A genetic engineer who tries to optimize Y1 (whatever that may mean) might fiddle with X1 and succeed; but if he must fiddle with X3 as well, he will mess up three other traits while optimizing the first. 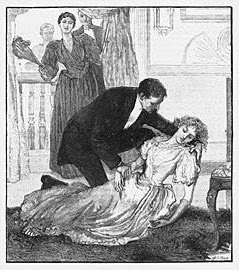 A story in ANALOG, whose title I have forgotten, featured a woman who had been engineered for beauty and wound up beautiful... and deaf. 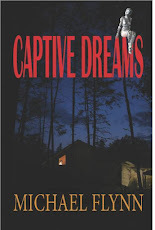 Indeed, TOF has written a story for his collection Captive Dreams entitled "Hopeful Monsters" which explores this issue. A funny thing happened on the way to mechanistic nirvana. Genes were once thought to be the blueprint from which organisms were built (Built by whom? Blueprints are not self-executing.) Then it became evident that no genome had enough information in it to comprise a set of blueprints! Instead, they must be more like minimalist rules that engender "emergent behavior." Does not work hard and save like Ant. But even blueprints need a contractor to read them. At best the genetic code is the formal cause of the structure; it is not the efficient cause. Something "reads" the DNA and builds proteins. 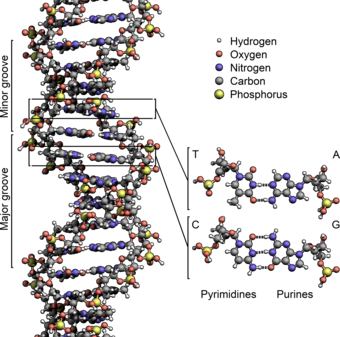 Outside a living body, DNA is just a molecule. Eats whatever is in path. These phase changes ([from grasshopper to locust]...) occur when crowding spurs a temporary spike in serotonin levels, which causes changes in gene expression so widespread and powerful they alter not just the [grass]hopper’s behaviour but its appearance and form. Legs and wings shrink. Subtle camo colouring turns conspicuously garish. The brain grows to manage the animal’s newly complicated social world, which includes the fact that, if a locust moves too slowly amid its million cousins, the cousins directly behind might eat it. So much for selfish genes. What does "selection" mean when the gene is not the sole determinant of the results? What is being "selected" -- and how? Probably a new set of equivocations on the term. Instead of standing gape-jawed in wonder at yet another level of complexity in the world, the Sola genetica folks will push back hard against the epigenetic folks and their "extended genotypes." No sir, TOF hears them say, the old-time beliefs are the best beliefs. Clap your hands! Give me that old-time genetics! It was good for Brother Darwin. Sorry. TOF was carried away for a moment. Another example of the indeterminacy of the genome is the experiment with helmeted water fleas. In the wild, these hard caps on the fleas' heads make them slightly less attractive to predator fishes. In the experiment, two cloned populations were used, genetically identical. One was put in water that had been doped with a chemical indicating the predator fish. The other was put in a tank with untainted water. The fleas in the first tank developed the helmet; but those in the second tank did not. Basically, if there were no chemical flags for the presence of the predator, the fleas did not use their genomes to grow helmets. Even though the same "instructions" were present in both. Some of the information the flea used was "outside the flea." A final example we have seen before is the Mediterranean wall lizard, which on an island devoid of plants was an insectivore and cannibal, on an island lush with plant life became a herbivore and developed a new organ to digest plant matter -- in the space of 20 years! All of this indicates that evolutions can take place rapidly -- although TOF supposes that not all do -- and can be rather massive, all-at-once, and targeted to an end. Not the gradual accumulation of small random changes. The new organ the wall lizards developed was not a random mutation: you'd wait a long time for that to happen. It was targeted to the lizard's new circumstances, and called up in some epigenetic manner by environmental cues. Nor was it a matter of a pre-existing organ gradually modified to a new purpose. That would be subject to the IDers' "mousetrap" critique. The modified organ would have to be at least survivable at all stages of its transformation. But if the genome possesses mechanisms for "natural genetic engineering" the whole intelligent design theory goes down the tube. The mutations aren't random, and the change is not gradual. Punctuated equilibrium does not need the Darwinian mechanism Eldrege and Gould described. Shapiro lists seven key insights that have upset the old "atomic" view of genes and which show how molecular biology has gone beyond 19th century mechanistic models to late 20th century cybernetic models. Genome change is not the result of stochastic errors but of biochemical (i.e., cellular) action. Genome components from different lineages can be combined. DNA change is a non-random process, resulting from well-defined biochemical operations, each leaving a characteristic signature in DNA structure. Collectively, these are called “natural genetic engineering” (NGE) operators. NGE operators can be activated or inhibited by epigenetic factors. Natural genetic engineering events can be targeted within the genome. Evolutionary DNA change occurs rapidly at all genomic levels of complexity. These changes are often combinatorial and generate novel functionalities. Cells execute purposeful (goal-oriented) DNA restructuring events during normal life-cycles in a non-random but also non-deterministic fashion. These findings undermine the prior assumptions of non-goal orientation, random mutation, and gradual change. Random mutations really don't happen all that much and the cell possesses mechanisms to repair such flaws. Shapiro has numerous links to papers supporting these lessons. Researchers at Princeton, for example, discovered that "the proteins themselves acted to correct any imbalance imposed on them through artificial mutations and restored the chain to working order." (*) The criticism leveled by atheists like Jerry Fodor against Darwinian theory is precisely that "selection" and "adaptation" are too damned teleological. If we don't have to wait for "random" "beneficial" mutations, then the whole no-time-for-evolution argument gets knocked into a cocked hat. If genetic change is sudden and (at least potentially) massive, the whole gradual accumulation of mutations disappears and the lack of transition fossils in the rocks becomes expected rather than inexplicable. The heck with wall lizards, locusts, and helmeted water fleas. What about people? What epigenetic cues might cause Bruce Banner to "go Hulk"? Or Peter Parker to developed his way kool spidey powers? Might some environmental factor cause human to develop "helmets" or new "organs" or give birth to those possessing them (with the terms understood generically)? Both Gully Foyle (in The Stars My Destination) and Davy (in Jumper) discovered an ability to teleport when placed in a life-threatening situation. If reality is never quite so dramatic, might it not produce something of the sort? Is the smooth-chested metrosexual a consequence of global warming? Will hirsuteness become more common if the climate turns colder? To what extent might climate actualize potentialities already present in the genome? And what about zombies? Are they the human locusts that result when overcrowding causes our genomes to be reread differently? What will a few generations of living in space do to us? Will the free fall conditions act as epigenetic triggers that lead to sudden "non-mutations" adapted to "life in ziggy," as in the case of Abd al Aziz Corrigan and Dr. Fransziska Wong in The Wreck of the River of Stars? If evolution is digital rather than analog, we could cruise along unchanged while the environment cues to which our genome reacts gradually change. Then we pass a phase boundary and -- shazaam! -- suddenly our kids look.... different. "Here's lookin' at you, kid." Or not. These are all arguments that Hume/Kant used against religious conclusions, so why should evolution be a sacred cow? Or did Hume/Kant NOT have the last word on the cosmological argument after all? Also, I have a completely random question for the O'Floinn. Does Robinson's theory of infinitesimals show that infintesimals are free from contraction, or that they "work good enough" to find Calculus answers. To me it seems that infintesimals just cannot stand on their own, since they seem to harbor an inherent contradiction, and that any true grounding of Calculus ultimately presupposes limits. If I'm wrong in this though, please do let me know. "Falling Bodies and Evolutions are Facts"
Surely, the facts here are fossils. That the fossils belong to million year old animals is a theory, and that these million year old animals are ancestors of present day animals is another theory. Thus, evolution is as much of theory as the mechanism behind evolution. I definitely see what you mean but I'm afraid you are missing part of the point of the argument, which is that evolutionary changes can occur rapidly (sometimes observably rapidly). We have seen evolution happen within our lifetime. The development of anti-biotic resistant germs is a example. That would be great SF, an idea that doesn't make my head explode so much as fall clean off. But between the idea and the reality, there's some fairly epic labor, no? Greg Bear's "Darwin's Radio" uses a kind of a similar idea, though not with zombies. Isn't that what the Ascians of Gene Wolfe's Soar Cycle are? Essentially a type of human locust? This sounds very much like a claim that the Darwinian "framework" (i.e., "metaphysic") is not falsifiable, since one may always cook up a Just-So Story within it. Or as I like to put it, it does no good to say that Darwinian evolution "could" do something. To have an explanation, you need to show that it *would* do it. Otherwise you're really just relying on chance, and pretty much any possible observation could, in principle, be explained (away) by chance. Ah! Your evolution-fu is stronger than mine! "actualize potentialities already present in the genome". And those potentialities got there by "natural genetic engineering". I'd buy that. In fact, I think I did already. One way to put it is that natural selection is built upon several billion years of natural genetic engineering. Another way, the way I have generally thought about it, is that the first huge and most important part of natural selection is that by means of which the working of the individual cell were worked out - which would include all the replication, expression, error correction - and teleology. The threat that a tampering deity and final causes might be required to make sense of this never bothered me anyway. My only question: in what sense does the fact that genes interact with their environment mean they are not 'selfish'? Traits get passed on because the genes get passed on. Selection of genes is always, without exception, in some environment - which environment includes the genes neighboring and interacting with the gene in question, as well as the creatures in the swamp, and the genes in the other creatures in the swamp, and so on. Still, midst the dizzying complexity and layers of interactions, the gene is still what gets selected. Otherwise, the trait doesn't get passed on. That's all I've ever understood by 'selfish'. Finally, I've long though that gradualism versus punctuated equilibrium was obscuring the point. Is there ever an non-punctuated state? Isn't that just something we assume when we see a similar form appear over a long lime? All kinds of 'punctuations' have likely occurred in the Coelacanth's environment over 400 million years, right? I guess it's paid for the upgrade to puncture-proof equilibrium. How fast or slow is 'gradual' anyway? It just seems unhelpful. What does seem helpful - and true - is the idea that creatures have evolved, or more properly, been selected (or, perhaps even more properly, been naturally genetically engineered) to evolve - that the lizards and locusts and cichlids each contain a genetic history of billions of years of evolution, and a toolkit of once and future useful genes. What if we discovered that humans and chimps do not share 99% of their genes but 99.9999999999999% of them? Would that then mean that a. the tiny difference is responsible for the actual difference between chimps and humans or b. that genes can not possibly have as much to do with determining physical form and brain potential as we think? Seems like Greg Bear anticipated this (again, as usual) in _Darwin's Radio_. You beat me to it. Not my favorite Bear, but still, pretty neat. So I decided to read the comments section of that article (yes, yes, I know) and the environment was distinctly hostile not only to Shapiro but to "wendell read", his defender, who was driven down by accusations of "creationism" and (horrors!) teleology. Shapiro, it seems, is a 'renegade'. This makes me curious: where in the scientific community can I find support for his views? Is there a sensible antidote to A Certain Famous Blog? TOF - I just want to express my admiration for your blog. I'm very glad to have found it recently, and you have edified me in many ways. I also recently finished Eifelheim, albeit via audiobook (so I did not catch everything), and really enjoyed it. Would have liked to have more scenes with Sharon talking physics! Like this blogspot, I have kept the information humorous and light - Again thanks for all the comments and blog spot info. It sounds like Shapiro is the Establishment guy and Goren is the outsider. But Darwin does mention Blyth. And finds speaks very nicely of him; in the early pages of his very first edition! Is't so? Then I stand corrected. He doesn't specifically credit Mr. Blyth (or even mention him as you say) in the area of artificial / natural selection. But he did generally hold him in high regard as a source of information; somewhere around page 24, give or take, though a search through this non-paginated text turns up Blyth at several other points too. a few days ago a friend of mine told me about this post, and it was an extremely pleasant surprise! Let me say that I find your standpoint deeply appealing - having much in common with my own - and your way of arguing very stimulating and enjoyable. I'm an Italian physicist and, currently, a high-school teacher of math and physics, who a few years ago started to wonder if Darwinism was, after all, the ANSWER to every single biological question. By “Darwinism”, of course, I mean the overarching paradigm that is well represented by Monod's “Chance and Necessity” concept. Consider that here, in Italy, the Darwinian point of view is the overwhelmingly dominant paradigm in science education and popularization. There are a few notable exceptions (like Sermonti and Piattelli-Palmarini), but in general there's no escape: any Italian child who takes interest in biological science is doomed to imbibe with Neo-Darwinian thinking along all of his life. From time to time, however, a few scientifically educated people start asking questions. In some cases, they even start trying to tell other people, by writing books or through the web. One of them, in particular, keeps a very active blog (http://www.enzopennetta.it/), with which I also cooperate. A few months ago, for example, we succeeded in contacting dr. Henry Stapp (a world-wide renowned physicist, who has postulated a Whiteheadian quantum ontology), who kindly gave us the permission to publish the Italian translations of his public domain papers (like this: http://www.enzopennetta.it/2013/05/teoria-quantistica-della-coscienza/). Just recently, we also contacted dr. Edward Feser, who kindly agreed to let us publish the translation of one of his philosophical papers (http://www.enzopennetta.it/2013/11/teleologia-una-guida-allacquisto/). What I am asking you, then, is your kind permission to publish an Italian translation of this post on our blog, obviously with a direct link to the original text. Due to the clarity and effectiveness of your argumentation, we believe it would help to show the scientific and epistemological weaknesses of the Neo-Darwinian concept. I await your kind reply (possibly at my contact email address). OTOH, you may want to contact Dr. Shapiro directly, at Chicago. Well, thanks for the suggestion! BTW, I think I'm going to order a few of your books... I used to be an SF fan, and they look interesting! Great! I've already bookmarked your site, I think it may be worthwile for us to follow it as well.